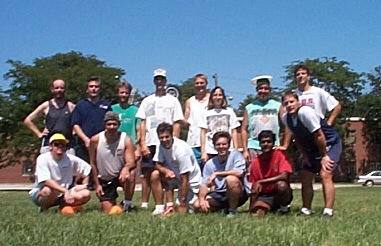 The Argonne Ultimate Frisbee Club is a group of folks who meet regularly on the grounds of Argonne National Lab to play Ultimate. Anyone is welcome to join us! The level of play ranges from beginner to expert, and all games are friendly. Read these pages to find out more about Ultimate and where to play. When: Mondays, Wednesdays and Friday, from noon to 1pm, weather permitting. Where: The grass field on the north side of building 200, right next to Westgate road. How: There is a sign up page where someone will call for a game, and when enough players have signed up (usually eight), a "Game On" message will be sent. There is also a mailing list that gets the notifications when games are called, and whether they will be on or not. How to find out more: read these pages to find out about local games and join the mailing list.